Discussion in 'Cables, Power, Tweaks, Speakers, Accessories (DBT-Free Forum)' started by miceblue, Jan 13, 2015. I'm mainly creating this thread so that the Light Harmonic Geek Pulse thread doesn't get too flooded with impressions about the Geek LPS by itself. I've been doing some testing between the Geek Out on my MacBook Pro and the Geek Out with the Geek LPS4. Between the two connection options, the LPS definitely improves the instrument separation and the overall blackness of the background, which improves the imaging. Another noticeable difference I hear is an improved bass extension with bass that's a little more present, which may give the sense of better dynamics in my music. Likewise, when powering the STAX SRM-252S amplifier with the LPS (Geek Out is connected to my MacBook and not the LPS), I notice a similar effect: the background becomes blacker, instrument separation and thus imaging are improved, and bass response becomes more noticeable. I plan to do some more testing later to see if the volume changes between powering options for some reason, but in the mean time, here's Something New for ya. I thought problem #2 was due to a grounding loop between the USB output and 12 VDC outputs, but that might not be the case since the volume of the buzzing increases with the volume level, and thus power drawn. Subscribed. Thank you Miceblue for your impressions on the LPS4 and for creating a separate tread. Hope LHL are taking note of your bugs. Looking forward to read more impressions while waiting for my LPS. Btw, awesome binarual recording. Kind low volume, but awesome. I'm getting the same issue with number two... Very annoying as I basically can't listen to my GO powered from the LPS. It has to be straight from my laptop.. Cheers MB. I have a regular LPS and agree with your thoughts on the sound quality improvement for my GO 450 compared to being plugged straight into my Dell Studio XPS laptop. I also get the same issue with the GO not being powered up if connected when switching on the LPS. Finally, my laptop doesn't recognise the GO when it's connected to the LPS via Slacker or slacker mini, which is pretty annoying as the GO is a bit vulnerable back there in my setup. Did you guys also get the 1G USB cable along with the LPS? Nope. The package only comes with the Geek LPS, the warranty card, rubber feet, power cable, and Molex-DC barrel cable. Ah, so there's an update regarding the buzzing sound. Apparently it's a manufacturing defect. I had submitted a ticket for my unit and now have the return label in-hand. Support confirmed that the buzzing issue affects a small number of LPS units and isn't a design miss. I plan to open a support ticket regarding my unit soon and I'll report back here if the problem is fixed. So finally got some time to play around with the LPS after getting a new adapter (i wanted a Europlug, got the UK plug instead). Anyhooo..., been listening to my iBasso D7 and my friend's GO1000 with it and the Schiit Wyrd for about 6-7 hours now. So only quick impressions for now. Don't think my opinion is going to change all that much though later to be honest. I need to do a lot more critical listening before posting impressions on select songs. 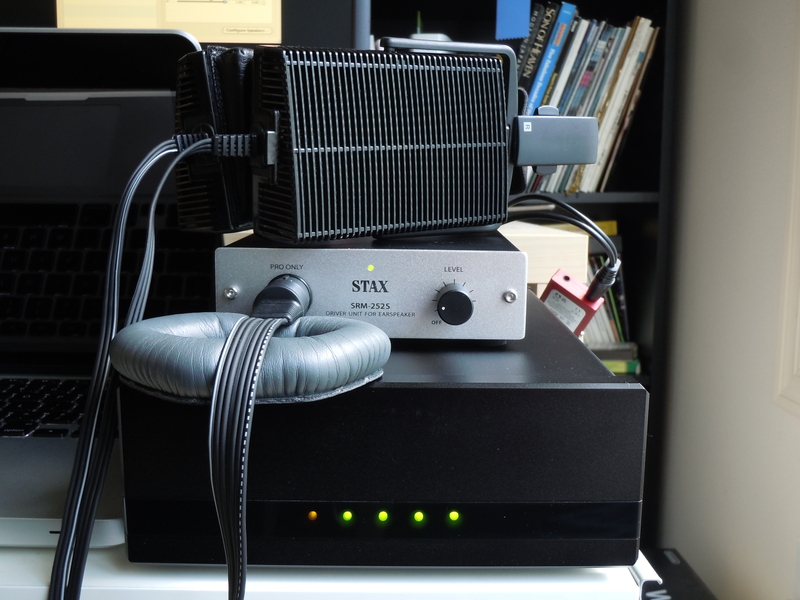 So these are my overall impressions of the LPS 5V USB DAC output vs. the Wyrd. Music through the Wyrd only: The Wyrd does a great job in cleaning up noise across the spectrum. The most noticeable difference to me with the Wyrd is that congestion in the lower midrange to upper bass area has reduced significantly. The midrange as a whole seems more fleshed out and more present with more dynamic bass. The treble sounds less harsh, especially through the HE-560 & HE-400. Music through the LPS (connected directly to the laptop): To me the mid-range seems to be negligibly better than through the Wyrd. Bass is definitely better defined, more extended, tighter and slams harder. Treble is not only smoother, but also just sounds right. It also has more air and just overall cleaner, airier, with a larger soundstage. Wyrd vs. LPS 5V USB: To me the true difference between these two lies in the way the notes decay. This brought out to the fore in the Rush movie's soundtrack and Enigma's Age Of Loneliness song. Music through the LPS's USB output sounds more cohesive and more organic, while through the Wyrd it sounds more mushy and slower. The LPS's USB performance is superb and much better overall than that of the Wyrd's. LH Labs have really knocked it out of the park. Awesome job, guys!!. Regards and have a great weekend, fellow fanatics one and all!! I did some AB comparisons between the Wyrd & LPS on different albums and tracks. I selected some tracks which to me have emphasis on different aspects of a song like soundstage, vocals, treble, bass etc. These are my final impressions. Wyrd vs. LPS on AR Rahman's "Rangeela" & "Kadhalan" albums: These albums encapsulate the best of Rahman's music for me. Rangeela has a "Western" style synthesised music which is multi-layered and complex. Through the LPS, each note occupies a precise space and decay for each individual note can be identified. The soundstage is much larger and 3D-like through the LPS compared to the Wyrd. This is not a bass heavy soundtrack at all. However fast bass notes coming out of nowhere and disappearing quickly are a hallmark of Rahman's music. The LPS renders these notes and their individual decay far better than the Wyrd. This album also has a mastering issue when it comes to sibilance. There are a couple of tracks, "Tanha Tanha" and "Kya Kare Kya Na Kare" on the Rangeela album which have wince-inducing sibilance even through the Wyrd. This is no longer a problem with the LPS, and you can actually increase the volume now and enjoy the music. Everything's just more fleshed out. It's like you are right there in the music. The "Kadhalan" album has deep bass notes, especially in the "Mukkala Muqabla" song, which decay quickly. The LPS again renders these precisely, while the Wyrd again sounds slightly smeared. This album is not as complex as the Rangeela album. Rangeela is not only my favorite album, but it's the soundtrack i use to audition and arbiter all gear. If it doesn't sound good with this album, it simply doesn't make the cut. To sum up, the Wyrd's like watching "Avatar" in 2D while through the LPS, it's in 3D. I agree that the instrument separation and imaging are much improved with the LPS4 though. If I were to describe its effect, I would say instruments are much better defined with more black space between them such that you can clearly identify where the instrument is in your head. What surprised me was that the change with the LPS was immediately noticeable. I use the Yulong P18 power conditioner with the Wyrd which means that i was getting a clean signal to the Wyrd itself. I didn't expect there to be such a big change while using the LPS. I was wrong. When both the Wyrd and the LPS are fed clean power using the P18, there's a definite difference. When both are run from mains power, sound through the LPS is unaffected while it sounds flatter via the Wyrd. The crazy thing is that i can clearly make out the differences even with relatively less resolving gear like the iBasso D7 DAC+Amp and the Yamaha Pro 500 cans. With the HE-560 and GO1000 combo the differences were even starker. Nicolo, I am waiting for my LPS to arrive (along with the HE-560 and the Pulse Infinity) and I was also thinking about getting the Yulong P18 power conditioner as well. Does the P18 do something for the LPS? From your thoughts I get the feeling that it's maybe better if I invest that money somewhere else in the system. The LPS is not affected by the P18 at all. You could invest that money in something like Norne Audio's Draug v2 or Solv X cables, balanced of course. I have the HE-560 with a balanced Draug v2 cable which adds that little bit of warmth i crave. By the way, the Wyrd is truly superb value for it's $99. I can't think of anything near that price which has such a dramatic improvement on audio clarity and dynamics.